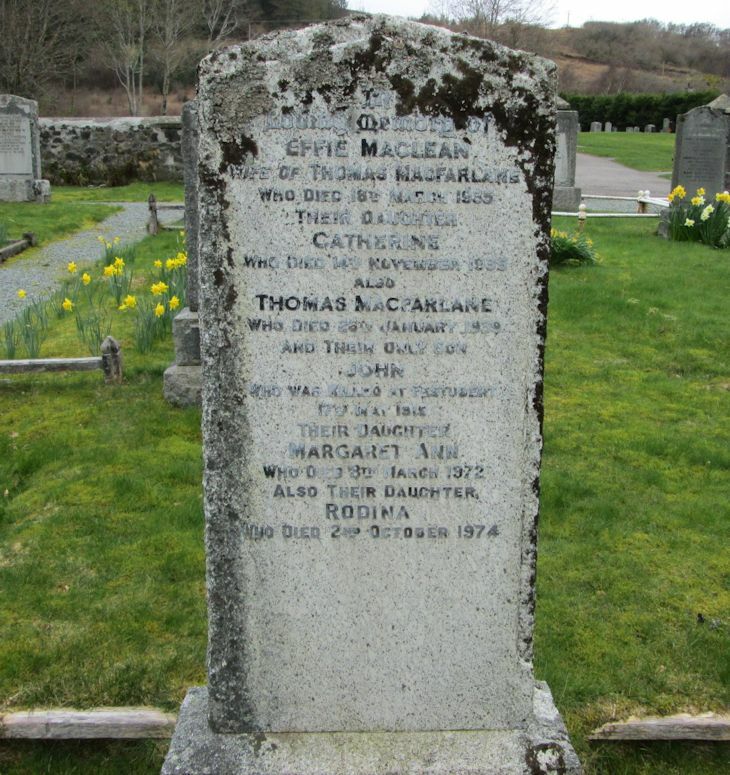 Skye Gravestones | Effie (Maclean) & Thomas Macfarlane & family. Effie (Maclean) & Thomas Macfarlane & family. In/loving memory of/EFFIE MACLEAN/wife of THOMAS MACFARLANE/who died 18th March 1935/their daughters/CATHERINE/who died 14th November 1935/also/THOMAS MACFARLANE/who died 26th January 1939/and their only son/JOHN/who was killed at Festubert/17th May 1915/their daughter/MARGARET ANN/who died 8th March 1972/also their daughter/ROCDINA/who died 2nd October 1974. Picture Added on 20 April 2014. This links to stone no 1246.Flora Macfarlane. Added by Helen Macdonald on 03 June 2014.